Amorphophallus(Amorphophallus paeoniifolius) requires fairly long growing season and a rainfall of about 150 cm during the crop period. A well-drained soil of medium texture is suited for this crop. Corm pieces are normally planted during February-March, before the onset of monsoon. Sree Padma: The crop matures in 8-9 months. Cooked tubers are free from acridity. Sree Athira: First genetically improved variety with very good cooking quality. Dig pits of 60 x 60 x 45 cm size 90 cm apart. Collect the topsoil to a depth of 15-20 cm separately and fill it after the pits are formed. Apply cowdung or compost at 2-2.5 kg/pit and mix with topsoil. Tuber cut-pieces weighing about 1 kg are ideal for planting. Dip the pieces in cowdung slurry and allow to dry under shade before planting. After planting, cover the pit with dried leaves or other mulching materials. About 12,000 cut pieces weighing about 12 t are required for planting one hectare. Most of the seed material will germinate within one month after planting. Mealy bugs usually attack the corm in field and store. Avoid planting corms already infested. Planting of minisett transplant and cormels gives better yield than traditional method. Cormels weighing 75-100 g each can be planted directly in nursery beds or in the mainfield with the central bud portion facing up at a spacing of 60 cm x 45 cm. 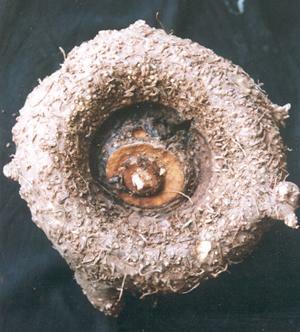 multiplication ratio in elephant foot yam could be enhanced to 1:15 as against the convention 1:3 by adopting minisett technique. Apply full dose of P2O5 and half the dose N and K2O (N:P2O5:K2O @ 50:50:75 kg/ha) after forty five days of planting along with intercultivation and weeding. Apply second dose of fertilizers (N and K2O @ 50:75 kg/ha) one month after the first application along with intercultivation and earthing up. The crop will be ready for harvest 8-9 months after planting. Raising green manure cowpea (seed rate @ 20 kg/ha) prior to elephant foot yam and incorporation of green matter at 45-60 days. Use of organically produced planting materials. Treatment of corm pieces of 500-750 g with slurry containing cowdung, neem cake and Trichoderma harzianum (5 g/ kg seed) and drying under shade before planting. Application of Trichoderma harzianum incorporated FYM @ 36 t/ha (3 kg/pit) in pits at the time of planting (FYM neem cake mixture (10:1) inoculated with Trichoderma harzianum @ 2.5 kg/tonne of FYM neem cake mixture. 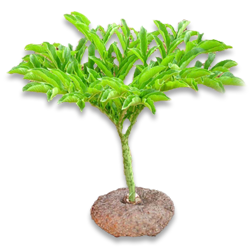 Trichoderma can be multiplied in FYM alone but it will take 15 days to form sufficient inoculam as against 7-8 days if neem cake is also used along with FYM). This is effective against collar rot caused by Sclerotium rolfsii. Application of neem cake @ l.0 t/ha (80-85 g/pit) in pits at the time of planting. Inter-sowing of green manure cowpea (seed rate @ 20 kg/ha ) between elephant foot yam pits and incorporation of green matter in pits a i 45-60 days. The green matter addition from the 2 green manure crops should be 20-25 t/ha. Application of ash @ 3 t/ha (250 g/pit) at the time of incorporation of green maure in pits.